My eldest daughter, fruit of my loins, joy of my heart, is obsessed with the Twilight book series. I should probably clarify that by saying she is obsessed with the male lead character, which means that my baby girl is now officially a “tween” and my life will never be the same (or sane) again. She recently celebrated her eleventh birthday, and I decided to bake her a cake. So I looked to the internet for my inspiration and I found it here, at sweetaustin.com . 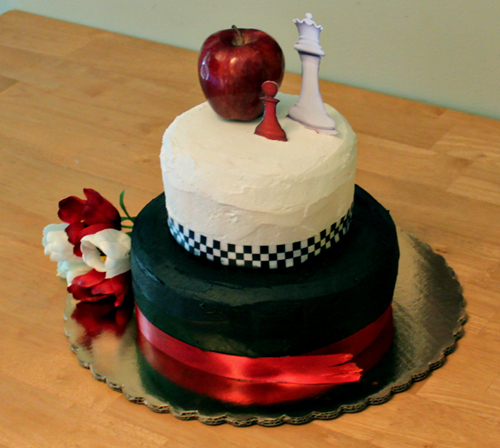 To those of you unfamiliar with the twilight series, my cake probably looks a little odd. Freakish even. The creepy reddish tinge to the photo doesn’t help either (New camera growing pains). But if you have read the books, you’ll get it. Or at least I hope you get it…. Morgan got it, and I got a few weeks worth of “you’re the best mom ever” karma. Freeze your cake layers. Bake the layers in advance, wrap them up well in plastic wrap, and freeze. I did mine a week ahead and they were still moist and yummy. The frozen cakes layers are also waaaay easier to frost. Make/buy a good buttercream frosting in advance. It lasts foreverish, so why rush at the last minute? Frost the day before with a crumb coat. The crumb coat is the thin, sloppy, crumb filled first coat of frosting. Do this the day before, and refrigerate the cake (uncovered is fine) overnight. The next day the crumb coat will be crusted over (in a good way) and the cake will be a breeze to frost and decorate. Do NOT store the uncovered cake in a fridge with peeled onions, fish, stinky gym socks, etc. Unless you want it to taste like peeled onions, fish, stinky gym socks, etc. Buttercream is a great refrigerator deodorizer; it absorbs bad odors and doesn’t let go. Kid rating on the finished product: 4 thumbs up! 3 comments to Let Them Eat Cake! hi mmommy that cake was fashionable and delicous! hi mommy that cake was awesome!! I also very much enjoy the red velvet. you are so awesome and I love your site. I do have a question for you however. How come you never made any of these lovely mouth-watering dishes for me when you were here?? ?